Dr. Rajesh Pradhan is a Consultant Gastroenterologist and Practices at Artemis Hospital in Sector - 51, Gurgaon. Dr. Rajesh Pradhan has Completed MBBS from Sriram Chandra Bhanj Medical College, Cuttack in 2002 & MD (General Medicine) from Sriram Chandra Bhanj Medical College, Cuttack in 2008 & DM (Gastroenterology) from All India Institute of Medical Sciences, New Delhi in 2014 and has expertise in Abdominal Pain, Constipation, Diarrhea, Gastroenterology, GERD, Heartburn, Hemochromatosis, Hepatology, Liver Diseases, Therapeutic Endoscopy, Ulcerative Colitis, Digestive & Liver Problem, Liver Gastric Digestive Disease etc. 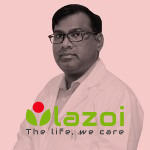 You can book an online appointment with Dr. Rajesh Pradhan on www.Lazoi.com.